It’s the battle-hardened finals veteran up against the new kid on the block. Geelong, a familiar face in the scheme of AFL finals over the past decade, will head into yet another September frenzy. It’s a completely different story for the Cats’ opponent tonight, Melbourne. The Demons haven’t played finals in 12 years and enter the game with a distinct lack of September experience to call upon. The Demons are ranked last of the teams in the eight for finals experience, with just 44 games thanks largely to ex-Hawk Jordan Lewis (23). Conversely Geelong is third with a combined total of 209 finals games. Likewise, the form guide is also stunningly opposite. Melbourne is coming off two strong wins against fellow finals sides – West Coast in Perth by 17 points and GWS by 45 points. Geelong has had an easy time of it, beating Fremantle by 133 points and Gold Coast by 101. Both meetings between these two sides this year have been decided by the last kick of the game. Max Gawn missed a sitter in the dying stages of round one to hand Geelong victory while Zach Tuohy kicked truly after the siren in round 18. Geelong has won the past four encounters against the Demons. 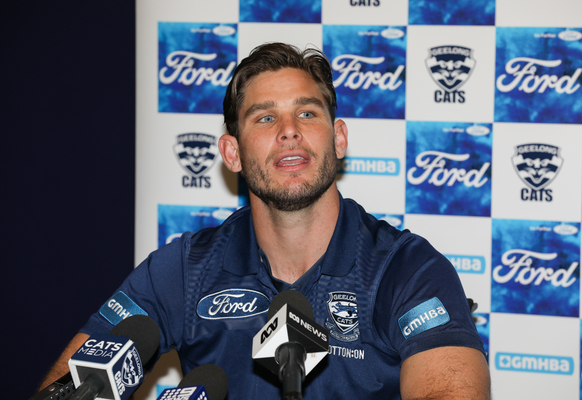 Simon Goodwin will likely send James Harmes to Joel Selwood to mind the inspirational Cats leader. Melbourne looks a better side without spearhead Jesse Hogan. Christian Petracca and Jake Melksham have been a revelation up forward in his absence. The big question is how does Chris Scott quell the influence of Gawn? Mark Blicavs has had a stunning season in defence and Scott will be reluctant to move him away from the back half. But with Zac Smith, who hasn’t played since round nine, and the inexperienced Ryan Abbott as the other options, Scott may have no choice. Rhys Stanley is still battling a calf injury. If Gawn gets off the leash, it could spell disaster for Geelong. Being an elimination final, there are no tomorrows for the loser of tonight’s game. The Cats have lost seven of their past 10 finals. It’s not a record that instils a lot of confidence. Tom Hawkins looms as a major headache for Melbourne. The big forward has been in sparkling form this season with Oscar McDonald likely to go to him at the first bounce. The MCG, which is usually very accurate in its predictions, has estimated a crowd of 90,000 for tomorrow’s game, which starts at 7.50pm. There’s a youthful energy about the way Melbourne has played this year. The Demons are the underdogs of the finals series and are many neutrals’ ‘team’ this September. Geelong will have just enough experience to get the job done, however. Cats by three points in another after-the-siren cliffhanger.